Procurement is the acquisition of goods and/or services at the best possible total cost of ownership, in the right quality and quantity, at the right time, in the right place and from the right source for the direct benefit or use of corporations, individuals, or even governments, generally via a contract, or it can be the same way selection for human resource. Simple procurement may involve nothing more than repeat purchasing. Complex procurement could involve finding long term partners – or even 'co-destiny' suppliers that might fundamentally commit one organization to another. Almost all purchasing decisions include factors such as delivery and handling, marginal benefit, and price fluctuations. Procurement generally involves making buying decisions under conditions of scarcity. If good data is available, it is good practice to make use of economic analysis methods such as cost-benefit analysis or cost-utility analysis. An important distinction is made between analysis without risk and those with risk. Where risk is involved, either in the costs or the benefits, the concept of expected value may be employed. Based on the consumption purposes of the acquired goods and services, procurement activities are often split into two distinct categories. The first category being direct, production-related procurement and the second being indirect, non-production-related procurement. Direct procurement occurs in manufacturing settings only. It encompasses all items that are part of finished products, such as raw material, components and parts. Direct procurement, which is the focus in supply chain management, directly affects the production process of manufacturing firms. In contrast, indirect procurement activities concern “operating resources” that a company purchases to enable its operations. It comprises a wide variety of goods and services, from standardised low value items like office supplies and machine lubricants to complex and costly products and services like heavy equipment and consulting services. The US Defense Acquisition University (DAU) defines procurement as the act of buying goods and services for the government. DAU defines acquisition as the conceptualization, initiation, design, development, test, contracting, production, deployment, Logistics Support (LS), modification, and disposal of weapons and other systems, supplies, or services (including construction) to satisfy DoD needs, intended for use in or in support of military missions. Acquisition is therefore a much wider concept than procurement, covering the whole life cycle of acquired systems. Multiple acquisition models exist, one of which is provided in the following section. Model of the Acquisition Process. Concept and Technology Development: is intended to explore alternative concepts based on assessments of operational needs, technology readiness, risk, and affordability. Concept and Technology Development phase begins with concept exploration. During this stage, concept studies are undertaken to define alternative concepts and to provide information about capability and risk that would permit an objective comparison of competing concepts. System Development and Demonstration phase. This phase could be entered directly as a result of a technological opportunity and urgent user need, as well as having come through concept and technology development. 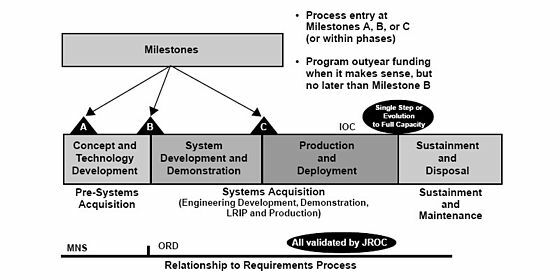 The last, and longest, phase is the Sustainment and Disposal phase of the program. During this phase all necessary activities are accomplished to maintain and sustain the system in the field in the most cost-effective manner possible. Another common procurement issue is the timing of purchases. Just-in-time (JIT) is a system of timing the purchases of consumables so as to keep inventory costs low. Just-in-time is commonly used by Japanese companies but widely adopted by many global manufacturers from the 1990s onwards. In order to achieve greater economies of scale, an organization’s procurement functions may be joined into shared services. This combines several small procurement agents into one centralized procurement system. Procurement may also involve a bidding process i.e, Tendering. A company may want to purchase a given product or service. If the cost for that product/service is over the threshold that has been established (eg: Company X policy: "any product/service desired that is over $1,000 requires a bidding process"), depending on policy or legal requirements, Company X is required to state the product/service desired and make the contract open to the bidding process. Company X may have ten submitters that state the cost of the product/service they are willing to provide. Then, Company X will usually select the lowest bidder. If the lowest bidder is deemed incompetent to provide the desired product/service, Company X will then select the submitter who has the next best price, and is competent to provide the product/service.In the European Union there are strict rules on procurement processes that must be followed by public bodies, with contract value thresholds dictating what processes should be observed (relating to advertising the contract, the actual process etc). Information gathering: If the potential customer does not already have an established relationship with sales/ marketing functions of suppliers of needed products and services (P/S), it is necessary to search for suppliers who can satisfy the requirements. Supplier contact: When one or more suitable suppliers have been identified, requests for quotation (RFQ), requests for proposals (RFP), requests for information (RFI) or requests for tender (RFT or ITT) may be advertised, or direct contact may be made with the suppliers. Background review: References for product/service quality are consulted, and any requirements for follow-up services including installation, maintenance, and warranty are investigated. Samples of the P/S being considered may be examined, or trials undertaken. Negotiation: Negotiations are undertaken, and price, availability, and customization possibilities are established. Delivery schedules are negotiated, and a contract to acquire the P/S is completed. Fulfillment: Supplier preparation, expediting, shipment, delivery, and payment for the P/S are completed, based on contract terms. Installation and training may also be included. Consumption, maintenance, and disposal: During this phase, the company evaluates the performance of the P/S and any accompanying service support, as they are consumed. Renewal: When the P/S has been consumed and/or disposed of, the contract expires, or the product or service is to be re-ordered, company experience with the P/S is reviewed. If the P/S is to be re-ordered, the company determines whether to consider other suppliers or to continue with the same supplier. Procurement quality is a mixed measure of the quality of purchased products and the performance of the procurement process itself since there is, not only, a need to purchase quality products by companies, but also the need for quality companies to purchase products. Public procurement generally is an important sector of the economy. In Europe, public procurement accounts for 16.3% of the Community GDP. In the European Union, the Commission has adopted its Communication on public procurement for a better environment, where proposes a political target of 50 % Green public procurement (GPP) to be reached by the Member States by the year 2010. Green public procurement (GPP), European Commission .